Prince Yang Myung (played by Jung Il Woo) is showing his hidden sword skill in MBC TV Wednesday and Thursday drama series The Moon that Embraces the Sun, staging Yang Myung plays to his strength to point the sword to Woon. On February 7th, 2012, the agency of Jung Il Woo published photo of Jung Il Woo in long hanbok robe and looking at the camera. The photo captured the moment of Yang Myung is unscrupulously pointing his sword at imperial guard of the King, Woon (played by Song Jae Rim), showing a leadership charisma. In the photo, the sharp eyes’ expression of Jung Il Woo holds the sword on his hand, and just blending together with the floating snow in the sky. 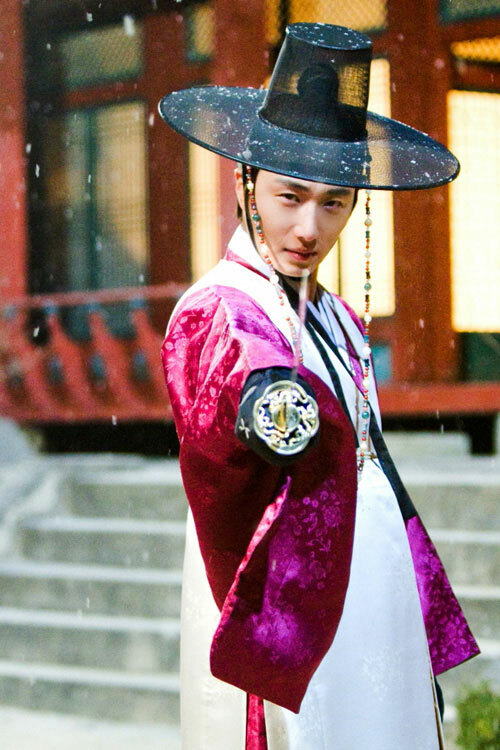 The action of Jung Il Woo lets people think of previous drama of Jung Il Woo, The Return of Iljimae, who looked glamorous when playing sword, instantly catching the attention of the crews on the set. Netizens who saw the photos said, “What’s happened between Yang Myung and Woon, so scary!” “Be safe Yang Myung, good fit holding the sword,” “Are him rescuing Yeon Woo?” “Like a picture,” “Yeah, looks very like when time in The Return of Iljimae, long time no see,” and so on. On the other hand, the future development of Yeon Woo, Hwon and Yang Myung is under the spotlight.